A chocolate sponge topped with two layers of rich, minty mouse and peppermint bark make for an impressive, festive dessert in this Peppermint Mousse Cake. It’s the last day of Peppermint Week. And we’re going out with a bang. It’s an impressive, you’ll-feel-like-a-better-baker-after-you’ve-made-it sort of bang. 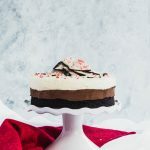 Chocolate Peppermint Bark Mousse Cake is not a throw it together affair. It’s not something you whip up in a few minutes to scratch an itch. It’s the kind of cake that you plan ahead for and take to a party. The kind of dessert that begs to be shown off and enjoyed by all. It’s also probably my favorite recipe that I’ve shared this week, but if I’m being honest I probably couldn’t actually pick. I’ll just take one of each. I’ll share too! You good with that? Let’s talk about the peppermint bark that’s piled on top of this beaut. If you follow me on Instagram (if you don’t, let’s be friends! ), you may have seen the recipe I posted to make your own peppermint bark. And while you will be amazed at how easy it is (and save a lot of cash), you can absolutely buy it and break it into pieces for the top of the cake. It’ll be just as gorgeous. You know what we shouldn’t talk about? My freaky blue alien hands. They just look weird, no matter what I do. Thank you for your consideration. Another thing we need to address… Mousse. It sounds scary, right? So glam. Too complicated. Tres French. But really, don’t be afraid of it. There’s a little learning curve with the gelatin. You’ve got it. It’ll look like it’s going to be a runny puddle. But never fear, it’ll set up nicely. In a word, you can do this. Don’t let French words scare you away. Preheat the oven to 350°. Line and grease an 8” round cake pan. Combine all of the dry ingredients in a mixing bowl. In a smaller bowl, use a hand beater to beat all of the wet ingredients together until smooth. Pour them into the dry ingredients and mix for about two minutes. Pour the batter into the prepared pan and bake for 20-22 minutes, or until a toothpick comes out clean after being inserted into the center. After about five minutes, turn the cake out onto a rack and let it cool completely. Use a sharp serrated knife to cut off any dome on the top. To prepare the cake for assembly, put it on an 8” cardboard round and then back in the pan. If the bottom doesn’t come out of your cake pan (most don’t), create 2 strips of foil that are long and skinny and place them under the cardboard round. These will be the “handles” to pull the cake out of the pan once it is done, so make sure the are hanging over the edges of the cake pan by several inches so that you can get a good grip on them. For the Chocolate Mousse: Place the chocolate, hot water, and butter in a heat proof bowl and melt over a pan with about an inch of gently simmering water in it. Stir occasionally until it is completely melted and smooth. Set it aside to cool but not hardened. Place the cold water in a small bowl and sprinkle the gelatin over it—this is called letting it bloom. Let it sit for 10 minutes, then heat it gently over a gas flame or candle until the gelatin has dissolved completely. Once it has, stir it thoroughly into the cooled chocolate mixture. Whip the cream until it has reached medium peaks. Stir about a quarter of it into the chocolate, then gently fold the rest in. Don’t overwork the mousse—it’s alright if there are a few streaks of cream left. Pour the mousse over the cake into the acetate ring and smooth it out. Shake the cake pan gently to remove any air bubbles and make sure the top is even. For the Peppermint Mousse: Repeat the steps for blooming the gelatin. Beat the egg yolks in a small bowl until smooth and set aside. In a small saucepan, make a custard by combine the whole milk, sugar, and 1/4 cup of the whipping cream. Heat over medium low heat until the mixture is steaming and bubbles are beginning to form around the edges. Carefully spoon some of the hot milk into the eggs, whisking as you do to bring the temperature of the eggs up gently. Once you’ve added about half of the milk mixture, pour it all back into the pan and cook over medium low, stirring with a spatula the whole time. Continue cooking until the mixture has thickened and coats the back of a spoon. Once it has thickened, remove it from the heat and add the peppermint extract. Repeat the heating method for dissolving the gelatin, then stir it thoroughly into the custard. Place it in a bowl and chill until it is completely cooled but not set, about half an hour. Whip the remaining cup of cream until it has reached medium peak stage and has about doubled in volume. Stir a quarter of it into the peppermint custard, then fold in the rest until combined. Pour this on top of the chocolate mousse, again smoothing and gently shaking to make it as level as possible. Place the cake in the fridge until the mousse is set, at least two hours. To serve, remove the cake from the pan and peel off the acetate strip. Smooth the sides of the mousse with a spatula or bench knife. Arrange pieces and bits of peppermint bark on the top however you would like. Serve chilled.